Sorry we haven't been making daily posts we had Map testing. 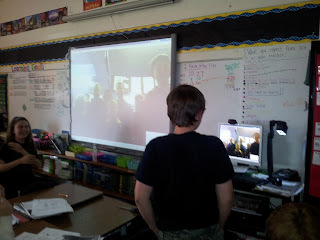 Today we have learned about the Civil War causes.We watched a brain pop on the Civil War which was really helpful. Most people in our class was very confused when we worked on our interactive notebooks (used a metaphor of siblings who fight over loud music for the differences between the North and South on slavery). We were in partners so it should have been more helpful, but maybe it'll go better tomorrow. Now, we're Skyping with our New Zealand pen pals! Sorry we have not been able to make daily posts but we have not had time because of MAP testing SORRY!! 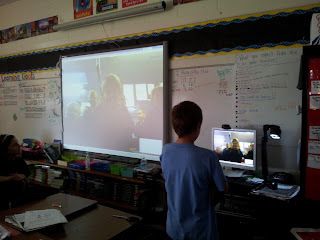 Here's Issac Skyping with Joshua! We really enjoyed Skyping with you, Room 121! Skyping you guys was so fun! The work that you have been doing on the Civil War looks very interesting.